Allergy sufferers already know that cleaning for health is a year round job. Complaints related to allergies and asthma increase dramatically in the Fall. End of Summer and back to school ranks among the most severe allergy periods. Drying leaves and other foliage coupled with rainy days and changing weather make conditions difficult (referred to as biogenic) at best for allergy and asthma sufferers. Allergens cling to clothing and shoes and find their way into your home and ultimately into your family’s nasal and respiratory systems. Vacuuming, frequent dusting and high filtration filters on your vacuum and heating system. Clean entrances and traffic areas more frequently to reduce contaminants and soil particles from outside the home. Have your carpets and upholstered furniture cleaned every three to six months by a professional carpet cleaner. Scheduled cleanings at regular intervals will eliminate the deep allergen residues and airborne particles that become embedded in carpets and other fabrics. For those with serious allergy problems cleaning alone may not be enough. 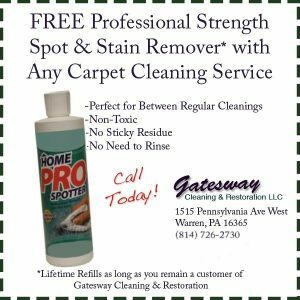 Gatesway offers a special Allergy Relief Treatment which is highly effective at neutralizing the allergens in your home. This treatment, while a powerful weapon in the battle against allergens, is safe for you, your children, your pets and the environment.